But not so, in the case of venturous sax player Adam Waldmann's 'Kairos 4tet'. 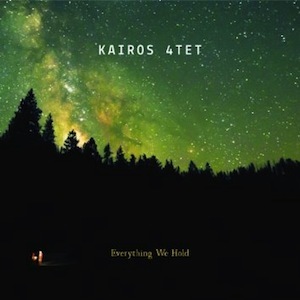 Since their highly promising 2009 debut, 'Kairos Moment' and sparkling 2011 follow-up, 'Statement of Intent', they have continued to push jazz frontiers to successfully forge a distinctive, progressive path for themselves. With their third album, 'Everything We Hold', Waldmann, as composer and player, again surrounds himself with his fellow luminaries from a buoyant contemporary jazz scene: Ivo Neame, one of the UK's finest pianists; the idiosyncratic, much-in-demand talent of Jasper Høiby on bass; and sparky, intuitive drummer Jon Scott. In addition, for this, their first release on Naim Jazz (Naim Label), the quartet has sensitively augmented their number with rich contributions from guest musicians and singers. Bravely, yet so effectively, Adam Waldmann has chosen to expand on the idea of previous recordings by featuring a number of songs which widen out their jazz-rooted genre into a more soulful sound. Throughout this 53-minute excursion, as well as providing a change of pace from a clutch of exciting, new, characteristic Kairos instrumentals, this songwriting is of an exceptionally high standard, often leaning towards folksong. Waldmann suggests that melodies are "gifts that people can put in their pocket and carry around with them" – and these are indeed strong, memorable combinations of tunes and lyrics (words penned by actor acquaintance, Rupert Friend) which become just that: beautiful, emotive and warm keepsakes. Emilia Mårtensson returns, creating a spine-tingling performance on the exquisite 'Narrowboat Man', her meltingly-gorgeous tone and diction instantly recognisable here, as well as on other tracks. 'Home To You' features the gravelly, Irish voice of Marc O'Reilly (with a hook that would equally be at home with Bruce Hornsby), as does the delicate love song, Ell's Bells. A chance meeting at the 2011 MOBO Awards (where the band won Best Jazz Act) resulted in the collaboration with acclaimed vocalist Omar Lye-Fook, who brings his deep, vocal presence to 'Song For The Open Road' (impressively translating into an accompanying video). Waldmann seems to have carefully matched song to singer, so much so that each appear to have been specifically crafted for them. The Kairos 4tet leader has also chosen to reward his longtime quartet colleagues with their own prizes – compositions in their name. So, the first of four interludes ('The 99') is subtitled 'Great Scott', with drummer Jon Scott providing a glimpse of the excellence to follow; 'J-Hø from The Block' celebrates the magnificence of bassist Jasper Høiby, showcasing his trademark percussive approach; and 'Finding Neamo' provides Ivo with the excuse (as if!) to solo nimbly and brightly, also including an appealing deeply-meshed reeds riff. Waldmann presides, on both soprano and tenor, with customary improvisational fluidity, fearlessly exploring alternative keys within keys (always a delight!). The ideas, textures and layers contained within this whole thoughtfully-programmed collection (plus bonus track downloads) are far too numerous to describe, but often it's the attention to fine detail which lifts this engaging recording to a higher level: the subtle use of shimmering harp (Tori Handsley); the accomplished string playing (an example being the wonderfully incisive portamento rise and fall which closes 'Narrowboat Man', really crowning this song); confident, lyrical cello soloing from Ben Davis; and Ivo Neame's homely accordion and harmonium. Recorded for the most part at Real World Studios, Somerset, Adam Waldmann's assembly of this diverse yet cohesive balance of accessible jazz is sure to garner a wider following, whilst continuing to enthrall current audiences. 'Everything We Hold' kicks off with a launch at Kings Place Hall Two on Saturday 8 June at 8:00pm, followed by national and international tour dates. How do I order the new cd. ?